Explanation: Do other stars have planetary systems like our own? Yes -- one such system is Kepler-90. Cataloged by the orbiting Kepler satellite, an eighth planet has now been discovered giving Kepler-90 the same number of known planets as our Solar System. 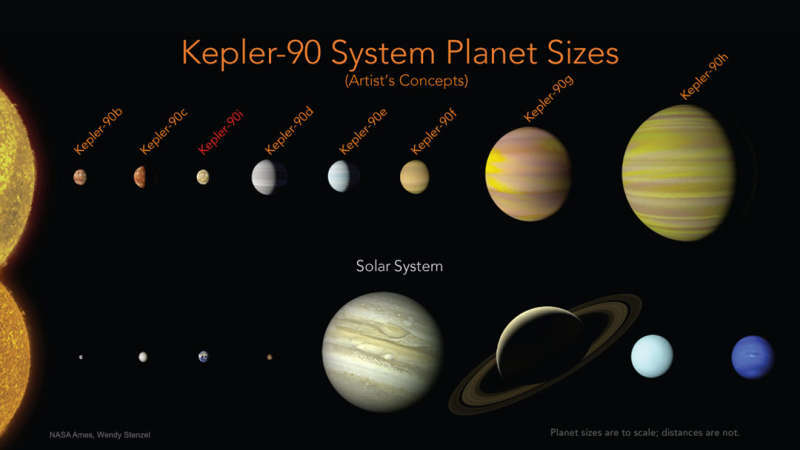 Similarities between Kepler-90 and our system include a G-type star comparable to our Sun, rocky planets comparable to our Earth, and large planets comparable in size to Jupiter and Saturn. Differences include that all of the known Kepler-90 planets orbit relatively close in -- closer than Earth's orbit around the Sun -- making them possibly too hot to harbor life. However, observations over longer time periods may discover cooler planets further out. Kepler-90 lies about 2,500 light years away, and at magnitude 14 is visible with a medium-sized telescope toward the constellation of the Dragon (Draco). Exoplanet-finding missions planned for launch in the next decade include TESS, JWST, WFIRST, and PLATO.